Detailed headlights & taillights. Black rear panel with silver "GT." 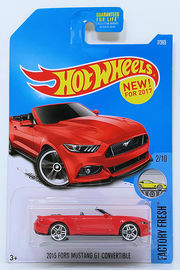 Silver rear license plate with Hot Wheels logo. Specialty: A more fuel efficient engine, improved suspension and refined interior makes the 2015 Ford Mustang Convertible a pony of the future with all the signature swagger of its past.